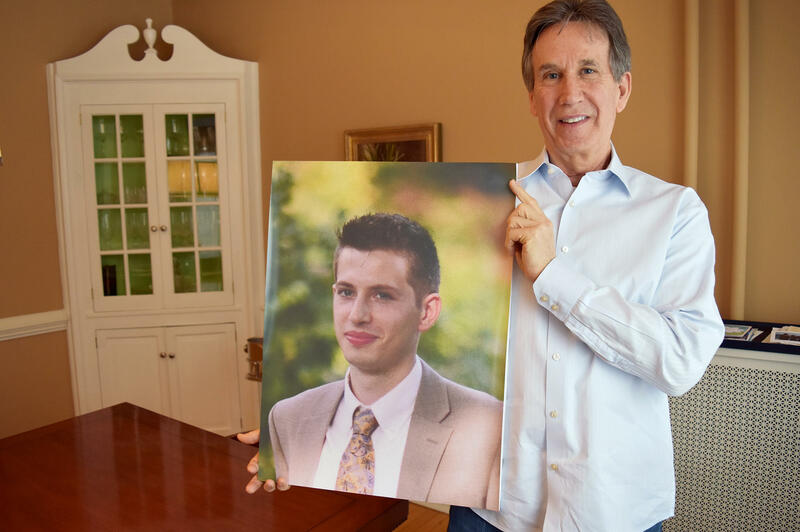 Dr. James Baker holds a photo of his son, Max, who had been sober for more than a year and was in college when he relapsed after surgery and died of a heroin overdose. Maxwell Baker died on Dec. 28, 2016, at age 23 — one month after a painful car accident and surgery. "He wanted to change the way our society treats addiction," his family said in his obituary, "because he knew how difficult it was to achieve sobriety and maintain it." Max at his drum kit. 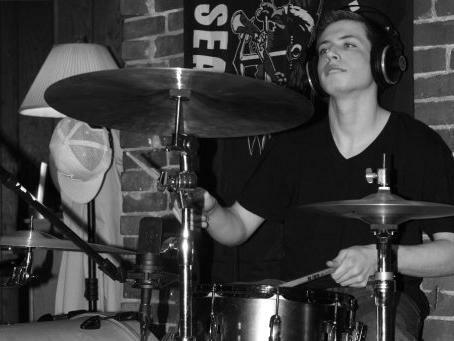 Playing the drums was Max's passion, his family says, as was "creating original music, listening to jazz, rock, and blues, shooting pool, following the Red Sox and Patriots, playing fantasy football with his family, and enjoying card games and chess." Max Baker is one such case. He started using prescription pain pills as a teenager in New England and quickly moved on to heroin. His father, Dr. James Baker, is a physician in the Worcester, Mass., area, and says he saw signs that his son was high on opioids — in Max's pupils and skin tone. He begged Max to stop. "He would have slurred speech, and be nodding off at the dinner table, and we'd go to a concert together and he would disappear and come back acting differently," James Baker says. It was a long, painful slog, but Max eventually sought help. When he was 22, he was prescribed an opioid called suboxone, a standard relapse prevention drug that helps wean people off opioids. After a year, he'd worked his way off that medication, too. He earned his high school equivalency degree, and a two-year associate of arts degree. Things were starting to get back on track, his family and friends thought. "He called me just a few days before Christmas in 2014," Max's father remembers. James Baker still has the voicemail message. "I just wanted to touch base with you," Max said in the message. "And also I wanted to let you know that I got a job." "It didn't matter to him if he was washing dishes or delivering pizza," James Baker says. "He was working." Max signed up at the University of Massachusetts in Lowell to continue his education — he'd decided he wanted to be a doctor, like his father. By all accounts, the young man's recovery was a success story. Then, as he drove home from a class one day in late 2016, a single moment derailed everything. "A young teenage girl didn't see him and just pulled out in front of him, and they had a major accident," says James Baker. Max's injuries included a broken bone in his hand that required surgery. He told his surgeon — Dr. James Shenko — right away about his addiction, and that he was scared that medication used for anesthesia and pain might cause a relapse. To minimize that possibility, Shenko turned to the anesthesiologists on the team. "And it became a big discussion between myself and anesthesia," Shenko says. "They were uncomfortable treating this patient differently than other patients because they felt that wasn't fair to the patient." There isn't any definitive guidance for doctors on how to best anesthetize patients like Max during surgery or how to prevent and ease their pain afterward. The anesthesiologists pointed to research showing that opioid-dependent patients who are on relapse prevention drugs (like suboxone) do fine with anesthesia and opioid painkillers afterward. 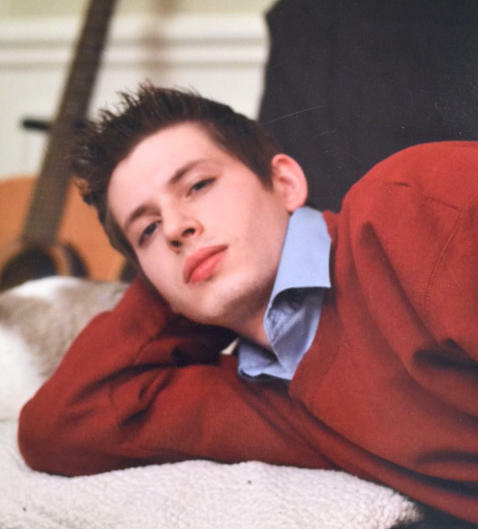 But Max was no longer taking suboxone — he'd been off that medication for a year. The anesthesiologist wound up using the normal drug cocktail to sedate Max for the surgery — a mix of drugs that included opioids. And the surgery went well. It was afterward, his father says, when Max was hurting, that the young patient confronted his surgeon and asked for opioids. "I need medicine for this pain," Max told Shenko. "I need real medicine." The surgeon took James Baker aside. "He had mist in his eyes," Baker remembers. "He put his arm around me, said, 'I don't know what to do, Jim.' "
"It was horrible," Shenko says. "Because you're a doctor — you don't want people to be in pain. But my fear is, 'this kid is going to go back to — his life is going to be altered because of what we're doing, in a bad way.' "
Shenko also feared that if he didn't give Max the drugs he wanted — if he prescribed a non-opioid and that didn't work as well — Max would find his own opioid supply. "I think he would have said, 'I'm going to take matters into my own hands.' Absolutely," Shenko says. In the end, the surgeon prescribed Max just a small amount of Vicodin — an opioid. Less than a month later, Max died of a heroin overdose. He was 23 years old. There's no way of knowing what triggered the relapse. Had he come off the subxone treatment for his addiction too soon? Did the opioids give him a taste of the drugs he'd previously managed to kick — enough of a taste to relaunch the cravings? Or was he trying to self-medicate — to ease his physical pain from the car accident and surgery — and simply took too much? Dr. Shenko, the hand surgeon, has been asking himself those questions. "What could you have done differently, what do you change, how do you do something differently," Shenko wonders. "How do you treat patients like this?" He now thinks hospital surgeons and anesthesiologists need to have ready access to addiction specialists, even before the surgery. "Let's bring in somebody, a specialist in dependency and addiction into this equation, and let's manage it through that," Shenko says. Dr. Stuart Gitlow, past president of the American Society of Addiction Medicine, agrees. If a surgeon or anesthesiologist were treating a patient with serious diabetes, they'd consult an endocrinologist. Addiction, he says, is no different. "Whether he gets the opioids or not is less of the question," Gitlow says. "The biggest question is what to do to ensure this patient's safety going forward during the period for which he's experiencing pain?" Gitlow says in Max's case, it's not that the addiction treatment didn't work. It's that it ended. And an addiction specialist might have made sure the surgery was followed by a stay in a sober living environment, a methadone prescription, or some other kind of treatment. But there aren't enough addiction specialists to meet the need. Nearly 2.5 million Americans are said to be addicted to prescription opioids or heroin. And there are only about 5,000 addiction specialists in the country — most of whom aren't affiliated with hospitals. It's a problem that Max's father now sees all too clearly. He says when Max was in recovery, he'd ask his son what he could do to help him, and Max replied: " 'Just be there, Dad. Let me know you'll always be there.' "
Now, James Baker says, he wants to be there for others fighting addiction. He's done what he needs to do to become certified to prescribe suboxone — the same drug that got Max off heroin initially — in the hopes of preventing more tragedies like the one that devastated his family. A federal survey says in 2015, nearly one and a half million Americans were treated for addiction to prescription opioids. That's just the number of people treated. When those people get hurt or need surgery, it's not always clear to doctors how to safely manage their pain. Craig LeMoult of member station WGBH in Boston has the story of one man pulled back into his addiction after a painful accident. CRAIG LEMOULT, BYLINE: Max Baker started using prescription pain pills as a teenager and quickly moved on to heroin. His dad is a doctor and says he could see in Max's pupils and skin tone the signs that his son was on opioids and begged him to stop. JAMES BAKER: He would have slurred speech and be nodding off at the dinner table. And we'd go to a concert together, and he would disappear and then come back acting differently. LEMOULT: It was a long and painful slog, but eventually, Max sought help. When he was 22, he was prescribed suboxone, a standard relapse prevention drug for weaning people off opioids. After a year, he was off that too. J. BAKER: And then he was sober and himself again. LEMOULT: Max earned his high school equivalency degree. J. BAKER: He called me just a few days before Christmas in 2014. MAX BAKER: I just wanted to touch base with you. And also I wanted to let you know that I've got a job. LEMOULT: He started working in a pizza shop and enrolled in college, hoping to become a doctor like his father. By all accounts, Max's recovery was a success story. Then one day as he drove home from a class, one moment derailed everything. J. BAKER: A young teenage girl didn't see him and just pulled out in front of him, and they had a major accident. LEMOULT: Max's injuries included a broken bone in his hand that required surgery. He told his surgeon about his addiction and said he was scared pain medication might cause a relapse. JAMES SHENKO: So the conversation was, can we minimize that? LEMOULT: Dr. James Shenko was Max's surgeon. SHENKO: And it became a big discussion between myself and anesthesia on - they were uncomfortable treating this patient differently than other patients because they felt that that wasn't fair to the patient. LEMOULT: There isn't any definitive guidance for doctors on how to treat a patient like Max. Max's anesthesiologist pointed to research that suggested surgery patients on relapse prevention drugs do fine with anesthesia and opioid pain relievers afterwards. But Max had stopped using the relapse prevention drug a year earlier. The anesthesiologist wind up using a normal drug cocktail for the surgery, including opioids. Max's surgery went well. But afterwards, his father says Max confronted Dr. Shenko. J. BAKER: And said - I need medicine for this pain. I need real medicine. And the doctor took me aside. And I can tell you, he had mist in his eyes. He put his arm around me. He said, I don't know what to do, Jim. SHENKO: It was horrible because you're a doctor - you don't want people to be in pain. But my fear is is this kid is going to go back to - his life is going to be altered because of what we're doing - in a bad way. LEMOULT: But he feared if he didn't give Max the drugs he wanted, Max would find his own supply. SHENKO: I think he would have said that I will take matters in my own hand, absolutely. LEMOULT: In the end, Dr. Shenko prescribed just a small amount of Vicodin, an opioid. Less than a month later, Max died of a heroin overdose. He was 23 years old. There's no way of knowing what triggered the relapse. Had he come off the suboxone treatment for his addiction too soon, did the opioids give him a taste of the drugs he'd previously managed to kick or was he trying to self-medicate to ease his pain from the surgery? Dr. Shenko, the hand surgeon, has been asking himself those questions. SHENKO: What could you have done differently? What do you change, or how do you do something differently? How do you treat patients like this? LEMOULT: He now thinks doctors like him need to be able to consult with an addiction specialist. Dr. Stuart Gitlow, past president of the American Society of Addiction Medicine, agrees. STUART GITLOW: Whether he gets the opioids or not is less of the question. The biggest question is, what do I do to ensure this patient's safety going forward during the period for which he's experiencing pain? J. BAKER: Just be there, Dad. Let me know you'll always be there. LEMOULT: Now he says he wants to be there for others fighting addiction. Dr. Baker's gotten the certification required to prescribe suboxone, the same drug that got Max off heroin initially, in the hopes of preventing more tragedies like the one that devastated his family. For NPR News, I'm Craig LeMoult in Boston. Transcript provided by NPR, Copyright NPR.